Pope Benedict XVI is about to create six cardinals from non-European countries, at a Vatican ceremony in St Peter’s Basilica. The cardinals, the closest aides of the Pope, come from the Philippines, India, Lebanon, Nigeria, Colombia and the US. Analysts say it is unusual for the Pope to select only non-Europeans. The Pope has said his choices aim to show “the Church is a Church of all peoples, [and] speaks in all languages”. 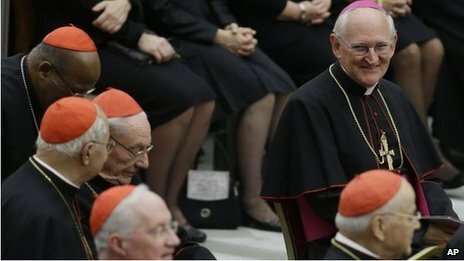 All six cardinal-designates are younger than 80 and therefore likely to be eligible to vote for a new Pope when the current pontiff dies. Cardinals wear red hats, known as birettas, and vestments to symbolize their readiness to shed their blood to defend their Christian faith. Pope Benedict XVI has previously faced criticism for appointing mainly Europeans as cardinals. It is the second consistory of the year. In February he created 22 new cardinals including 16 Europeans, seven of whom were Italian. By adding six non-Europeans to the number of 114 cardinal electors, the Pope has slightly shifted the geographical demographic of cardinal-electors. Europeans will still make up the majority, but down from 55% to 51%. The Church estimates less than a quarter of the world’s Catholics live in Europe. In order better to reflect the international character of Catholic Church leadership, the Pope decided to give red hats to Catholic archbishops from three countries with large Muslim populations – India, Lebanon and Nigeria. Cardinal-designate John Onaiyekan is the archbishop of Abuja in Nigeria, where Christians and Muslims each make up about half the population, and dialogue between the two faiths is increasingly important. He says the Pope’s elevation of Patriarch Bechara Boutros Al Rahi, the head of the Maronite Church – an ancient Lebanese Christian Church in communion with Rome – is seen as a sign of Vatican support for religious diversity in Lebanon. During a visit to Beirut in September, the Pope said Lebanon was a model for the region. He has called on Christians to remain in the Middle East despite rising Islamism. Before Saturday’s ceremony, Pope Benedict met Lebanese President Michel Sleiman. A representative of the Shia militant group Hezbollah will attend Saturday’s ceremony.